Two Guys Two Guitars and all your acoustic favourites. 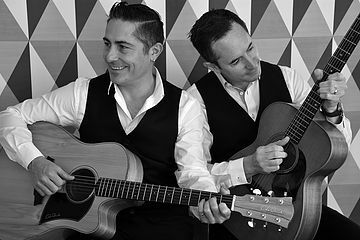 Jaime and Chet available for bars, corporate and private functions, this duo can provide subtle ‘pre-dinner’ entertainment right through to a stompin’ good time party vibe. With the use of stomp boxes and loop pedals, they can create a massive sound that’ll keep you grooving all night. They come with all equipment including P.A. system and stage lighting for full effect. They are also available with their covers band ‘Hands Off’.